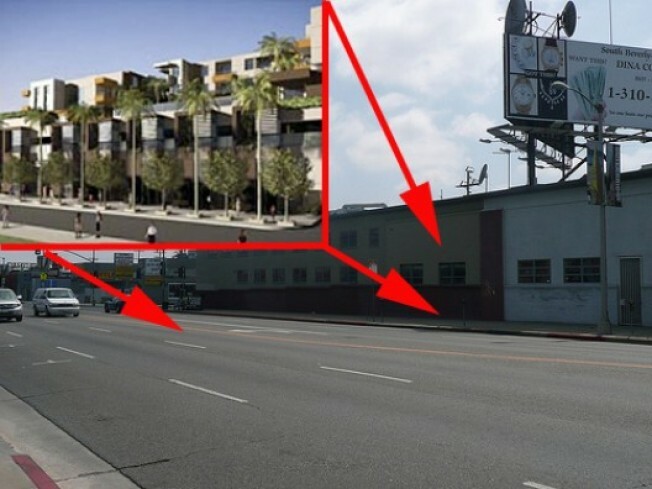 Two big neighborhood-changing projects are scheduled to be heard today before the City Council's Planning & Land Use Committee, the subcommittee that oversees land use planning: The long-delayed and litigiousLa Brea Willoughby project, that 7-story, 219-unit apartment development proposed for the corner of La Brea and Willoughby (with a minimum of 40,000 square feet of commercial space) and the Westfield development, which would add housing, offices, and more to a big chunk of Century City. But given that both developments fall in departing City Councilman Jack Weiss's district, it wouldn't be surprising if any action over the project was pushed back (again) to July, when new incoming city councilman Paul Koretz shows up to take over Weiss's seat. Meanwhile, as of yesterday, the sign was still up at a residence located near the proposed development. And you can peer at tiny renderings of the project developer Martin Group's web site. What ticks off neighbors is that the land use would be changed from industrial* to residential; they also worry about height and aren't thrilled with the idea that their single-family homes will abut a 7-story development. On the other hand, this is a pretty scrappy stretch of La Brea that could benefit from some type of development. Tour of the neighborhood in the gallery.